The beginning of the end…. I did it! I actually wrote a book! Yes this is the dreaded thesis that has kept me from blogging on an even semi-regular basis not to mention all manner of social engagements, worry-free evenings and general happiness over the last four years. Alright I might be over-dramatising a bit but it has been a long, painful road and I am unbelievably pleased to be on the home stretch at last. 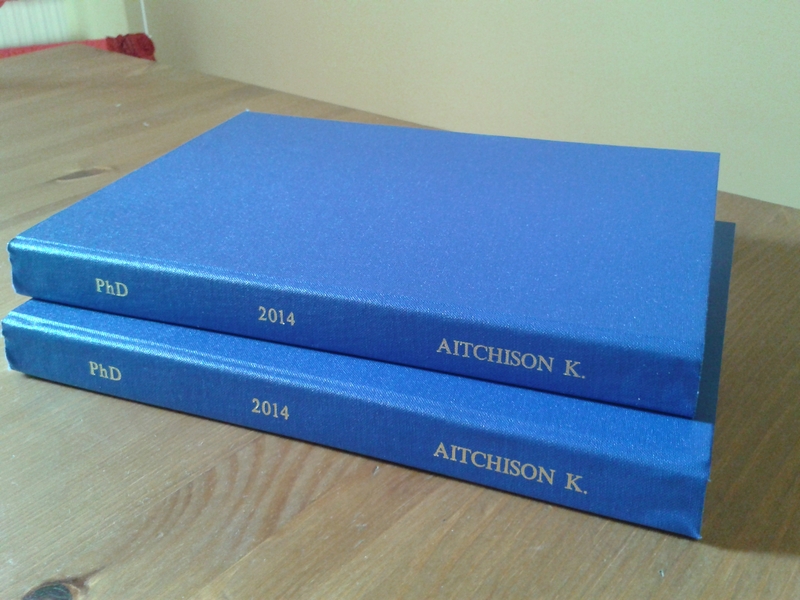 I have written, bound and printed the thesis. Tomorrow I hope to hand it in (there’s some concern over how easy this will be due to the opening hours of the student centre not entirely meshing with a full-time job but I have a very understanding manager 🙂 ) and then in some week’s time (the exact date is not being disclosed to anyone!) I have to face the dreaded viva, an oral exam which can last up to four hours, which is essentially the end of the process. There’ll be corrections after that but with any luck in six month’s time I’ll be a free woman. And what will I do with myself then? !